You don't need a professional landscaper or construction crew to make your house the envy of the block. 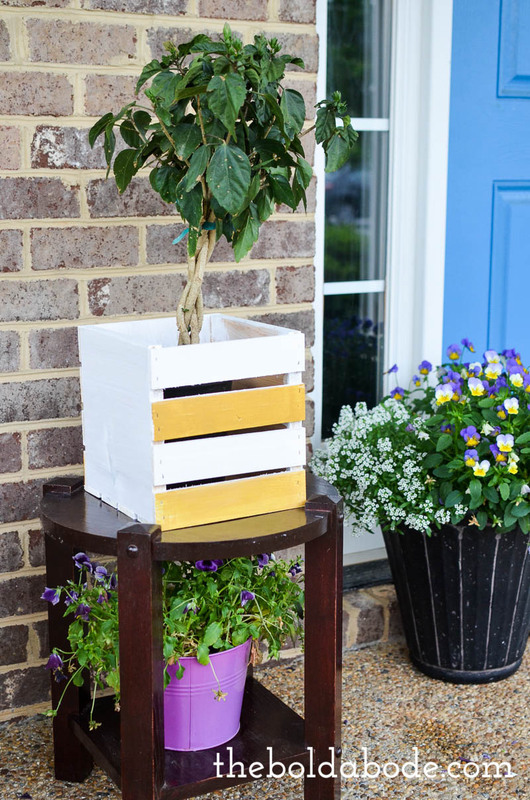 Borrow inspiration from these colorful curb appeal ideas to infuse style and utility into your porch, patio, or garden with your own two hands and a humble can of paint. Dressing up a plain doormat with paint is one of the easiest ways to dazzle guests at your doorway. Recreate this daring DIY doormat by applying duct tape in vertical stripes to a fiber doormat, then paint the exposed areas of the mat with a playful punch of color. Let the paint dry, then remove the tape to reveal a perfectly straight striped design. Steal the look of decorative cement floor tiles at a fraction of the cost of commercial cement tiles with this faux tile floor DIY. If you already have cement floors installed on your porch or patio, you're halfway to achieving this inventive design. Now, simply roll a neutral shade of paint over the cement, use a homemade stencil to trace a geometric-inspired pattern across the entire floor, then outline the pattern with a white or light-colored paint pen. Oil-based paint pens result in a longer-lasting more durable finish that's great for exterior floors that are exposed to weather or foot traffic. If old wooden crates are collecting dust in your garage or shed, give them a second chance at life as a perked-up planter for homegrown flora. Cover the bare wood in one to two coats of paint, then embellish the crate with colored stripes or stenciled or hand-drawn patterns. When the paint dries, fill it with plants and park the planter on your porch to show off your green thumb. Is your old mailbox little more than a rusty hunk of metal sitting at the front of the house? Grab spray paint and a sponge brush to transform it into a bright and cheery letter box. Start by detaching the flag and hardware, then spray paint both the box and flag in contrasting shades. Then, use octagonal stencils and a sponge brush to add a playful geometric-inspired pattern. Now, all that's left to finish off this simple curb appeal idea is paint or apply house numbers or monograms to artfully display your address. This bold wooden sign advertises your hospitality from your front porch for anyone who may happen to pass by. All you need to recreate the design is a scrap piece of pallet wood, latex or oil-based paint pens, and a store-bought or homemade stencil. Hang the simple sign with twine near the door to bring a smile to all who enter. While stone fountains lend a look of luxury to porches and patios, they come with a hefty price tag. Not so with this budget-friendly faux stone fountain made of (gasp!) plastic. The weathered patina looks like it took years to achieve, but you can recreate it in a matter of hours by spray painting an affordable plastic fountain, following up with a homemade whitewash, then wiping down the fountain with a cotton rag. The resulting age-worn finish is nothing short of stunning. As this DIY proves, bold design can work its magic on even the most practical elements of an entryway. A painted house number brings style to this front door, while making the address known to mail carriers and guests alike. Best of all, you don't have to remove your door to add a painted house number. Simply wash and dry your painted door, then take to it with a paint marker or top with adhesive vinyl numerals in your favorite font. Who knew? With the help of a trusty can of spray paint, you can show your weather-worn brass doorknobs the door without ever replacing them. Just detach and clean the knobs, then coat with a black spray primer and finish with rubbed bronze metallic spray paint for an ebony finish with a subtle shimmer. Re-attach the doorknob to give your door a boost of beauty that lasts. Bringing old brass glass sconces into the twenty-first century is easy with this two-step paint job. Simply disassemble the light fixture and coat the individual components in a shade of spray paint that contrasts with your house siding. If you can't remove and paint some of the components, don't fret. Re-assemble and mount the sconce to the siding, taping off the glass and sticking brown paper to the siding to protect it from paint. Then, spray paint the exposed trim, let dry, and flip on the light to see this simple yet effective curb appeal idea brought to life.